We look forward to joining together with PSC patients, their families, friends and with altruistic travelers to help fight this devastating disease, while participating in a wonderful cycling experience in the process. Bike tour operator, Great Freedom Adventures, announces Pedal for PSC Charity Bike Ride, a three day cycling event on Martha’s Vineyard, a captivating island jewel seven miles off the coast of Massachusetts. The goal of the September 25-27 event is to raise awareness and funds to fight Primary Sclerosing Cholangitis (PSC), a chronic, progressive disease that damages the bile ducts of the liver. Pedal for PSC features an oceanside warm-up ride on the first day, a metric full- or half-century ride on the charity challenge day, and a victory ride to the island’s most famous beach on the third day. PSC causes inflammation of the bile ducts, which in turn leads to scarring and narrowing of the ducts. Bile builds up in the liver causing extreme fatigue, severe itchiness, pain and jaundice. As the disease progresses, damage to liver cells occurs and many PSC patients will eventually require a liver transplant. There is currently no cure and available treatments have limited effectiveness. The need for funds for research on disease causes, effective treatments and ultimately, a cure, is urgent. Pedal for PSC Charity Bike Ride is open to the public and will benefit PSC Partners Seeking a Cure, a 501(c)3 nonprofit foundation established to provide education and support to PSC patients and their caregivers, and to raise funds to research causes, treatments and cures for PSC. For more information, go to http://www.pscpartners.org. Representatives from the Denver-based foundation, who have seen-first hand the suffering caused by PSC, will participate in Pedal for PSC and will be on-hand to provide information about the disease and research initiatives. 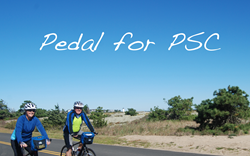 Over three days, Pedal for PSC participants will explore Martha’s Vineyard, a stunning island that has enchanted presidents, celebrities and vacationers alike. Riders pedal through island farms and picturesque fishing villages, passing iconic lighthouses along the way. On the “challenge” day, riders have the option of cycling 50k or 100k and those choosing the full metric century will circumnavigate the 25-mile long island. With both routes, cyclists discover charming coastal towns, maritime forests of pitch pine, the gingerbread cottages in Oak Bluffs and the red cliffs at Aquinnah. Participants will visit and stay in the 19th century seaport village of Edgartown, containing handsome mansions built by whaling captains, along with many beautifully maintained colonial homes that predate the whaling era. Bike paths along the water’s edge give riders a breathtaking view of sandy beaches and salt-water ponds filled with myriad birds. “We look forward to joining together with PSC patients, their families, friends and with altruistic travelers to help fight this devastating disease, while participating in a wonderful cycling experience in the process,” says Jeanne Rummel, founder of Great Freedom Adventures. The three-day, two night Pedal for PSC Charity Bike Ride requires a per person fundraising minimum or donation of $2,200. Included in the event is lodging, meals, bikes, guides, van support, transfers, luggage transport, daily snacks and drinks, maps, training tips and a post-ride celebration. For more information or the full daily program please see: Pedal for PSC Charity Bike Ride.